bike date thursday wants to hear from you! After Saturday’s baby shower, we got to enjoy some additional time with our friends from out of town. Lucky for us, they were all game for a bike ride and were more than happy to borrow a bike in order for us to ride to a local café for lunch. Good thing T. and I have accumulated something close to a personal bike share program in our garage because we were able to round up the five bikes needed for our group and in a size that fit everyone pretty comfortably. So off we went along neighborhood route to a café with outdoor seating so that we could continue to enjoy the nice weather. 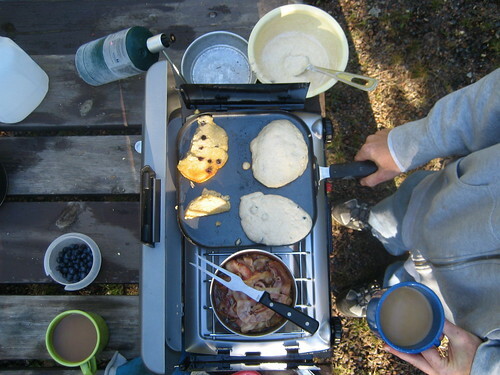 We stretched lunch into a three hour affair, enjoyed some seasonal fares like strawberry rhubarb crepes with fruit from a local berry farm, and caught up on stories and life news. And then we biked home to shape the evening’s plans. It was so enjoyable to be able to share my daily life with my friends while they were in town and riding bikes is a big part of that. So it was even better that I was able to show them the town from the perspective that I usually get when riding to campus, the coffee shop, and home. And although we often joke about how we have a tiny bit of bike addiction and T. and I are constantly trying to cut back on the amount of bikes in our garage, it is nice to have that spare bike sitting around for when visitors come. While I joke that we now have something close to a bike share program, our holdings are still pretty humble. For a true home-run bike share, check out what co-blogger Xander of 416 cyclestyle has done in order to get more of his friends and relatives on a bike. He accumulated a bunch of inexpensive bikes, fixed them up, and started an actual bike share program out of his own garage to serve his family and community. I love the idea and the generosity behind it. Would you ever consider opening your garage up to your community and creating something to this effect? If you’re interested in starting your own mini bike share, check out the article on The Urban Country to read more about how Xander approached this project. We spent the past weekend relishing the company of our family and friends (especially those out-of-towners, who we don’t get to see as often) and celebrating the upcoming arrival of baby C. Three good friends of ours collaborated on throwing us an amazing backyard baby shower held at our friend H’s house. On the schedule: plenty of great food, cute kids, drinks, flowers, beautiful home-made gifts (so many! so awesome! ), and so much to be thankful for on our part. T. and I were blown away by the thoughtfulness and generosity of it all. 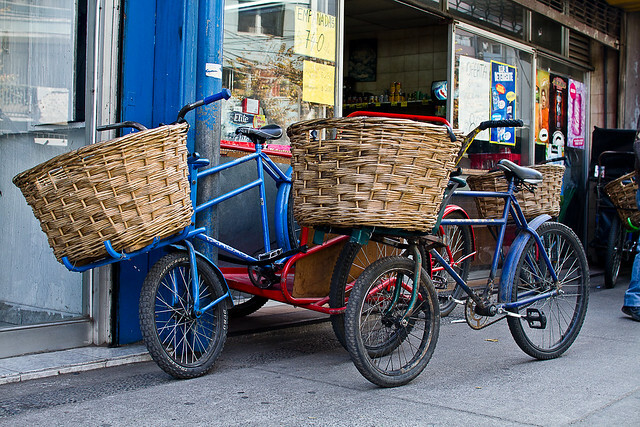 Just a random collection of pictures from the Bike Basket Flickr group that caught my eye and made me smile. 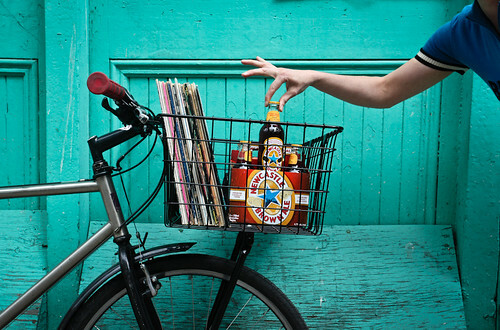 What do you carry in your bike basket? Add your photos to the group! Happy Father’s Day to all the dads out there! And a special shout-out to my awesome husband who’s about to become ‘dad’ to more than just our pup Indie. Rock on, dads! Hi, I’m Evelyn. My husband Jon and I are both mathematicians. He’s a postdoc, and I’m finishing my Ph.D. I have a car, but we use our feet and bicycles for most of our day-to-day transportation. Before I met Jon, I probably hadn’t cycled since I was 12, but he encouraged me to hop on that bike and become a bike commuter, and I’m so grateful for that! I am in better shape than ever, and I think I get to know a city better on a bicycle than by foot or car. Last spring, shortly after we got married, Jon started a short-term research position in Marseilles, France. I stayed behind for a few months until school was over, and then we had a lovely month together in Europe. Most of the trip consisted of math conferences and research with collaborators in France and Germany, but we decided to make the last week our honeymoon. Our favorite honeymoon day was probably the day we spent cycling through vineyards in Burgundy. Burgundy is one of the fanciest wine regions in France, and the Burgundy tourism industry has helped create miles and miles kilometers and kilometers of cycling paths through the wine villages and vineyards there. On the advice of our guidebook, we rented bicycles from a nice shop in Beaune, a short train ride from Dijon, where we were staying. On the way out of town, we stopped and picked up a baguette and some cheese, fruit, and packaged salads from the supermarket. (Since it was Sunday, the artisan boulangeries and fromageries were closed.) The quality of cheese and bread available in French supermarkets is amazing, and the price is rock-bottom, so France is a surprisingly cheap place to eat, at least in the summer when you can (and will want to) eat most of your meals as picnics. Unfortunately, it has also given me a taste for really good French cheeses, which are quite expensive here. If you’ve never tried Roquefort societe, you should. You’ll thank me later. After stocking up on provisions, we cycled one of the most popular routes on the voie verte, the system of bike paths through Burgundy. It is a 20km path that takes you from Beaune to Pommard, Volnay, Meursault, Puligny-Montrachet, Chassagne-Montrachet, and Santenay. Of course, we rode out and all the way back for a nice 40 km trip. The trail was very well-marked, and it’s closed to car traffic, so it’s very peaceful to ride. Being from a very flat area, some of the hills were pretty challenging for us me, but making it to the top felt like an accomplishment. The villages we rode through were beautiful. We had a lovely picnic in the middle of the day, and on our way back, we stopped at some wine sellers to taste and buy. We definitely suggest doing wine tasting and buying on the way back rather than the way out for safety reasons and so you don’t have to carry any purchases as long. (And while we’re at it, go easy on the tasting. You’ll be sweating a lot, and the alcohol might affect you more than you realize.) Burgundy really takes its wine seriously. They have a lot of appellations d’origine controlée, sometimes even for a particular part of a particular vineyard. It was very cool to try a wine, knowing we had just been in the precise location where the grapes were grown. We were able to taste some great wines, and now I can make fancy comments like, “You know, I really don’t prefer Pommards. They’re too oaky and spicy for my taste.” We picked up a couple bottles for a wedding gift for Jon’s brother and a bottle for ourselves. We’re planning on using it to celebrate my thesis defense. After we returned our bicycles in Beaune, we walked around the city a little, and in one of the shop windows, we saw a very old wine bottle. As it turned out, we had gotten the same wine plus 118 years for Jon’s brother! When we were planning our trip, it almost seemed like cycling through vineyards in Burgundy was too cliched, but some things are cliches for a good reason. Spending a day in the vineyards with your lover is divine, and it’s one of our fondest memories from any of our trips. When we go to a store with a nice wine selection, we look through the Burgundy section to see if we recognize any of the cities from our trip. It gives us a chance to reminisce about what a great bike date we had. If you’re planning a trip to France and want to try cycling through vineyards in Burgundy, this website might help you plan your adventure. Happy cycling! Thank you, Evelyn and Jon, for sharing this special bike date with us! I wish you many more happy years of marriage with plenty of bike dates thrown in! You can see more bike dates from the bike date series here. happy one year to simply bike! Simply Bike is one year old this week! Happy blog birthday! I can’t believe that it’s been one year already since I decided to create this little space online to talk about my bike adventures. 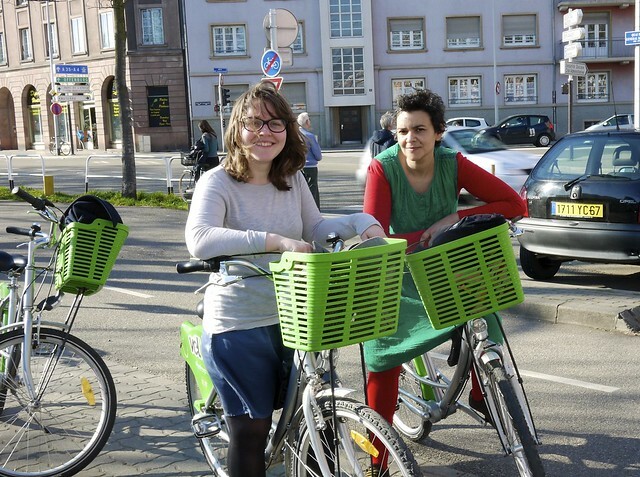 When I first started out, I had just returned from a year spent in Germany and was very much inspired by the bike-friendly lifestyle I had witnessed abroad. T. welcomed me home with a newly purchased mint green Electra Cruiser (seen above), which quickly became my BFF during that first summer back in the Midwest. The cruiser (‘Mojito’) was the perfect bike for a novice bike commuter like me – easy to ride, comfortable, in great condition and reliable, and beatifully green and shiny, thus making me happy every time I saw it. But as summer dawned on, I realized that a cruiser was not the most practical choice for a commuter bike (too heavy, too slow, and with limited cargo capacity) and my love affair with vintage 3-speeds began. And not just my love affair with vintage bikes but a love affair with cycling in general. And as these things go, the more I read about cycling and, by extension, about healthier and eco-friendlier living, the more I implemented changes in all areas of my life. With that, the blog took on a different focus with posts not only limited to cycling but sustainable living choices and ‘green’ practices as well. These days, I love what this space has become; a place for me to voice my thoughts on a variety of topics, to journal my family’s adventures, and to continue exploring ‘life on two wheels’. I love writing Simply Bike and I hope you enjoy reading it. And I’m always very thankful for all the comments and feedback, which is what makes this project such a rewarding and valuable one to me! So thank you for reading and contributing! In June, I started bike commuting on a regular (read: almost daily) basis and I taught myself about the basics: learning how to name the different parts of a bike so I didn’t sound like a complete novice when talking about it. In July, I continued to teach myself about bikes and figured out how to ‘size’ a bike. 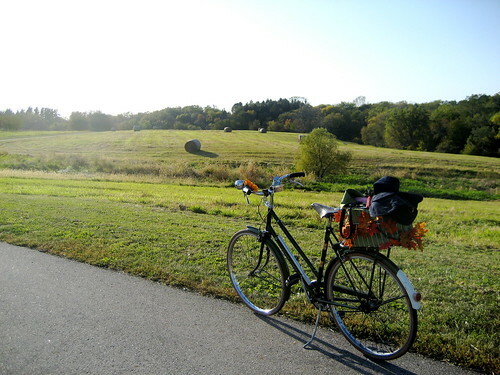 I went on my first bike picnic with my husband, discovered a nearby lake I could bike to, rode my first 70 mile ride as part of RAGBRAI, and consequently conquered by long-time fear of roadbikes. In August, I traded in my cruiser for a ‘his and hers’ set of vintage Raleighs we found on Craigslist and started learning as much as I could about owning and restoring vintage bikes. I learned, for instance, that new bike brakes will wail like a cat in distress if they’re not toed-in correctly and, with the confidence in those new brakes, I started cycling not only on dry days but on rainy days as well. The month’s highlight? T. and I celebrated one year of marriage by going on a bike date to the restaurant where we had previsouly dined on our wedding day the year before. In September, I finally added lights to my bike as the days got shorter and darkness came sooner. The academic year started and so did my new teaching job as a lecturer in the foreign languages department. 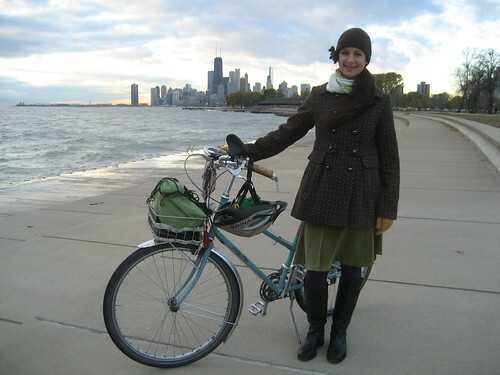 I began using my bike not just for leisurely rides around town or to the grocery store but also to get to work each day. 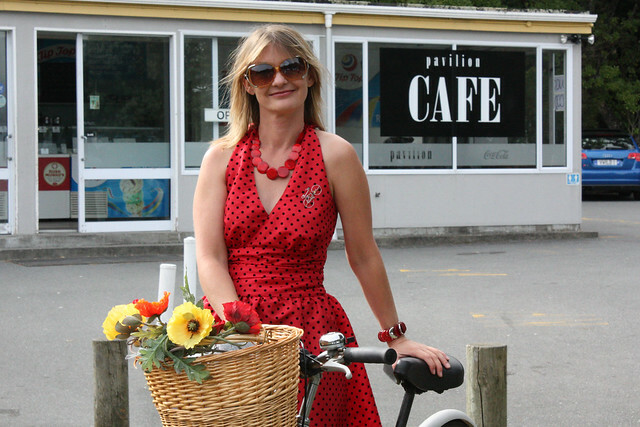 I wrote my first post on cycling in my workclothes with some tips on picking fabrics and patterns that faired well in the still hot late-summer temperatures. T. and I managed to squeeze in a camping trip over the Labor Day weekend in celebration of what would have been our wedding date had we not eloped the previous summer. We took our dog Indie along and it was my first time camping and canoeing with a pup in tow. Much fun was had. :) We were so encouraged by that experience that we tried to introduce Indie to cycling as well, but as my guest post on LGRAB revealed, that adventure was less of a hit. To sum it up: the dog survived but the Burley trailer did not. I acquired my second vintage bike – a 1978 Raleigh Grand Prix roadbike – and T. and I hit the trails for more fast paced bike rides. I started to really love riding a roadbike and that feeling of speed and adrenaline. But I still continued to appreciate my slower and more relaxed rides to campus for work each day and was shocked to discover that over 50% of Americans live within five miles of their work (like me) but that only 2% get there by bike. Yikes! I wrote another post on commuting in your work clothes relating how easy that transition has been for someone like me who works so close to home. In October, I discovered how beautiful fall is when experienced by bike. But at the same time, I started to struggle with life in the small town I found myself to be living, I started to miss life in Europe, and I attempted to feel more involved in my community by tackling some bike related issues I saw amiss. By the end of the month though, I realized that I just needed to keep calm and pedal on. In November, I had a much better time with things. It was my birthday month and T. celebrated with me by agreeing to a birthday bike ride to my restaurant of choice despite it being dark and a freezing 27 degrees F. when we set out. He also spoiled me with homemade raspberry cheesecake and the surprise of another lovely vintage bike, my now beloved Peugeot Mixte named Bee. Momentum Magazine featured a photo that T. snapped of us on one of our bike rides together and we were shamelessly excited to see it in print. I continued cycling although the weather turned really cold and I even managed to do some of my holiday gift shopping by bike. Another November highlight? Attending a conference in Chicago and meeting the lovely Dottie and her husband Greg, who graciously hosted me and showed me Chicago in November from the perspective of a bike saddle. It was a great trip that I’ll always remember fondly. And besides biking in the winter (new to me), I also wrote about running in the winter (something I’d perfected a few years earlier). In December, I pulled out my mountain bike with thicker tires for the wear and tear of cycling in the snow. Things slowed down as the semester came to an end and we took off to visit our families for the holidays. We ended the year by snapping our customary self-timer family portrait with the nuggets (our pets) on New Year’s Eve, before ringing in the new year. In January, I safely made it through the first trimester and made it public that we were going to have a baby. My confidence grew at cycling through snow and I continued to run with my dog outdoors as well. I wrote one of my favorite posts about my grandfather, who at (now) 85 years old continues to bike and beekeep. He’s always been an inspiration to me and a role model for living life to the fullest. In February, we continued to get more and more snow and I even had to abandon my bike on campus for a week. I wrote about running during the second trimester and took pleasure in finding articles about other cycling mamas. In March, I had the pleasure of contributing to a Momentum Magazine feature on ‘the Bike Lifestyle’ and adding my own two cents about what makes a bike commuter. The snow started to melt and with sunnier days at hand, T. and I went on our first bike date for the season. I continued to reflect on running while pregnant, started prenatal yoga, and enjoyed short bike rides on my lunch breaks. On a less happy note, we received some startling information about my pregnancy and learned to work through the shock and fear that came with that, while on the home front, we welcomed spring and began planting our first garden. In April, I launched the Bike Date Series and put together a composite of all my posts with information on owning a vintage bike. While I came to realize that I was done running for the rest of my pregnancy, cycling continued to feel good and I even undertook a 15 mile trail ride over the weekend with T., visiting one of the largest pedestrian bridges in the world. I continued to attend prenatal yoga and reflected on how important community is and finding those people that make a place a home. I also grappled with the fact that I am living in a place that’s not my first choice but that constantly being miserable about it is neither productive nor healthy. After many talks with T. about this, my thoughts reached a sort of tipping point and I realized that I need to accord less importance to where I am living and more to how I am living. This shift in focus came out of many discussions we had about how we want to parent our children and what kind of attitudes and behaviors we want to model for them. Since making that switch in my thought process and writing about it here, I feel like a weight has been lifted off my shoulders and I’ve been able to find much more pleasure and contentedness in my everyday life. 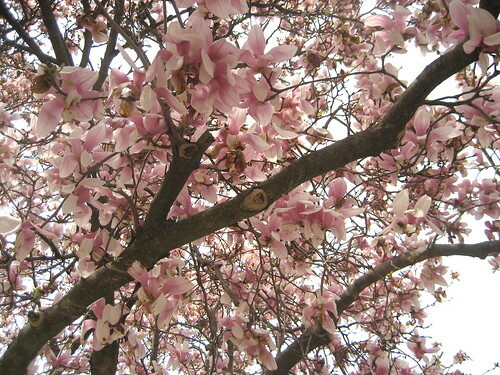 In May, spring finally sprung and my daily commute turned into a flowery wonderland. We celebrated my first Mother’s Day with a bike date to the botanical garden and I continued to ride, slowly but surely, through the third trimester. So what will the future of Simply Bike entail? I honestly don’t know as I stand on the verge of one huge life change… having a baby next month. But I do know that I want to continue writing here and sharing my thoughts with you for as long as that feels right. 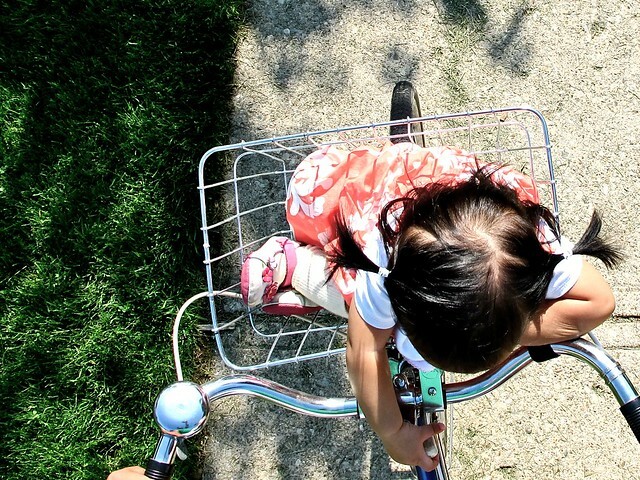 And I know that I’ll be excited to write about life as a family of three, learning to bike as a group (not just a duo), and introducing our little one to all the joys of cycling, camping, travel, and the great outdoors. So I hope that you stick with me in Year Two of Simply Bike and I look forward to more posts and more conversations as the year unfolds. ♥ S.
PS: If you like Simply Bike and have enjoyed it thus far, I’d be honored if you’d take a moment to vote for me on Circle of Mom’s Family Bike Blogs list. You don’t have to register or log in, just give me a little ‘thumbs up’ to keep me in the running. (And if you’re really generous with your time, keep clicking over and voting once a day until the end of the month!) Thank you!